Well, following my visit to no less than four grocery stores today, I am prepared to soon embark on new culinarily adventures, so I’m using up some of these fresh ingredients. 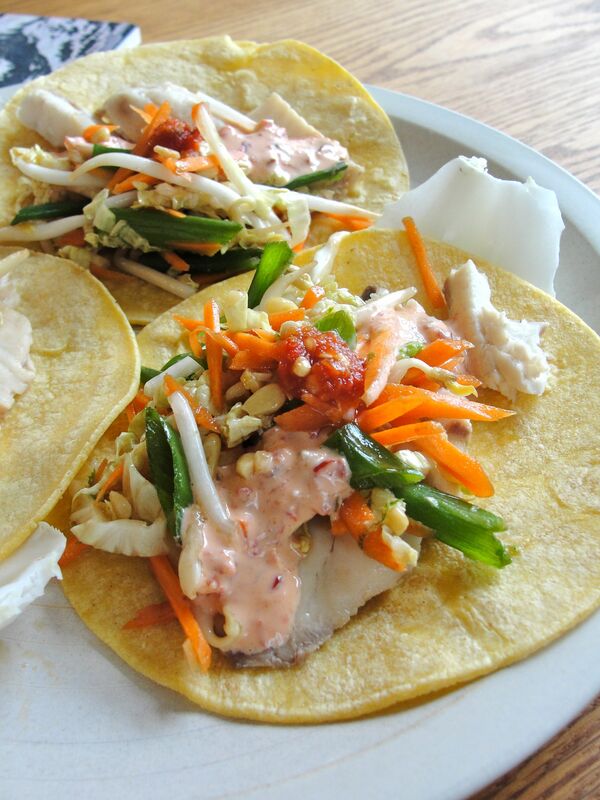 I absolutely love fish tacos, thus made up these asian-fused-with-Tex-Mex fish tacos for lunch. 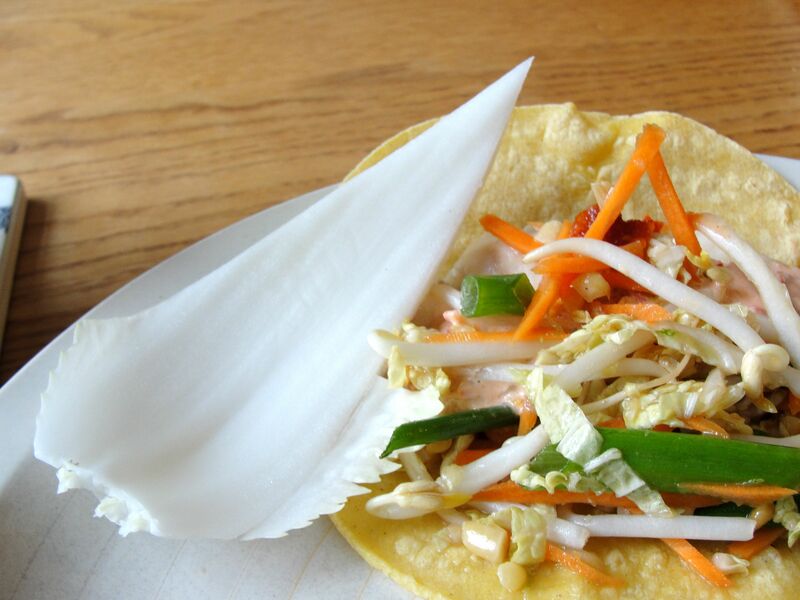 Typically fish tacos consist of three components atop corn tortillas: fish, a cabbage slaw, and a sauce. 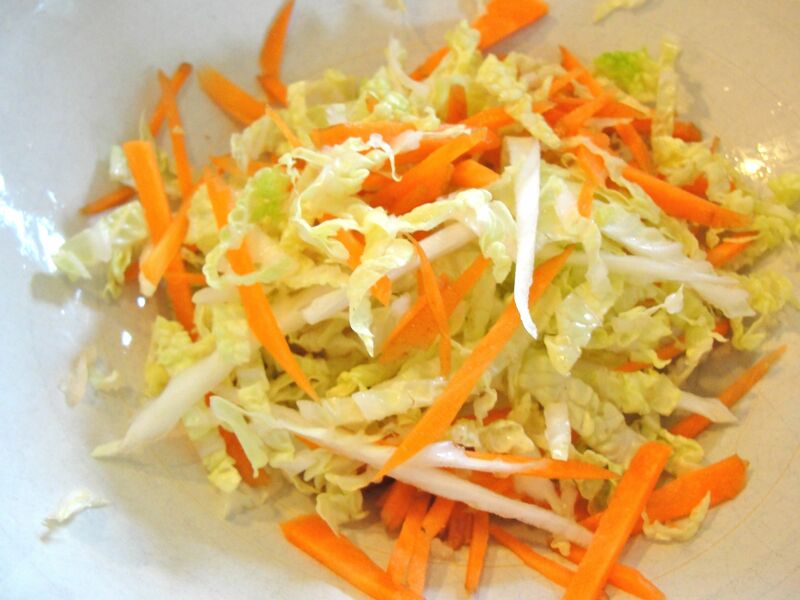 Dissolve the hoisin sauce in the rice vinegar and toss with the rest of the slaw ingredients and let sit until needed. 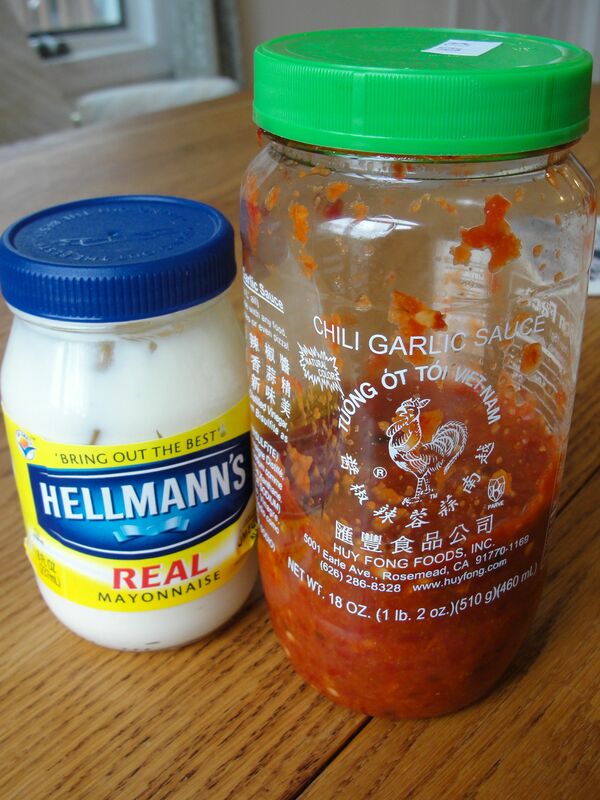 For the sauce, simply mix equal parts of mayonnaise and chili garlic sauce. 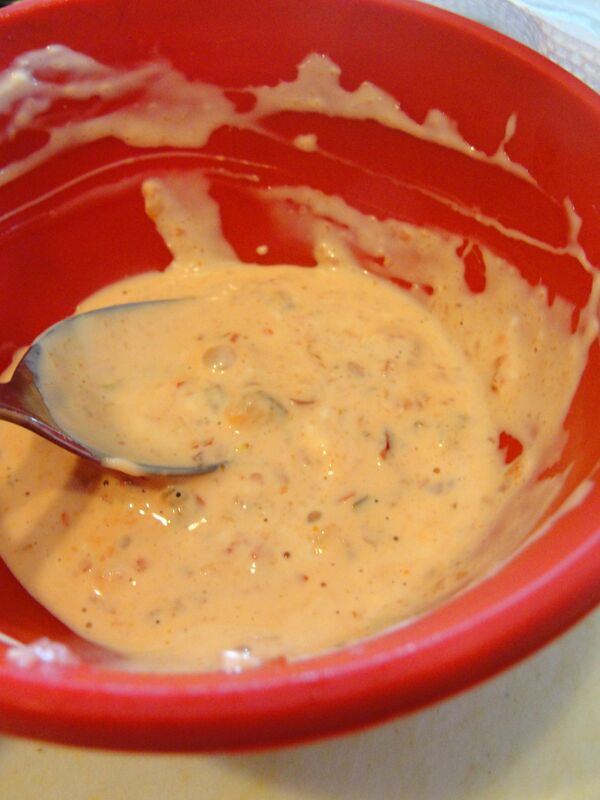 I used about 2 t. each, per serving (i.e., 3 tacos) and taste-tested it… I think I decided to add half again as much chili sauce. OK, that’s easy! 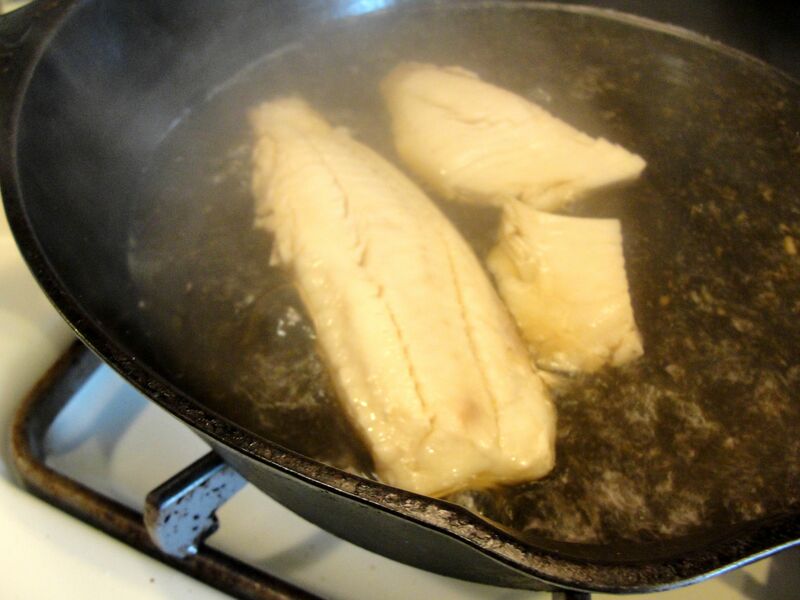 For the fish, I chose a tilapia fillet (from frozen, thawed in water), and poached it in a salmon-and-vegetable-based fish stock along with a couple teaspoons of soy sauce. Here, I had just separated some pieces to test for doneness (i.e., if it will flake apart.) 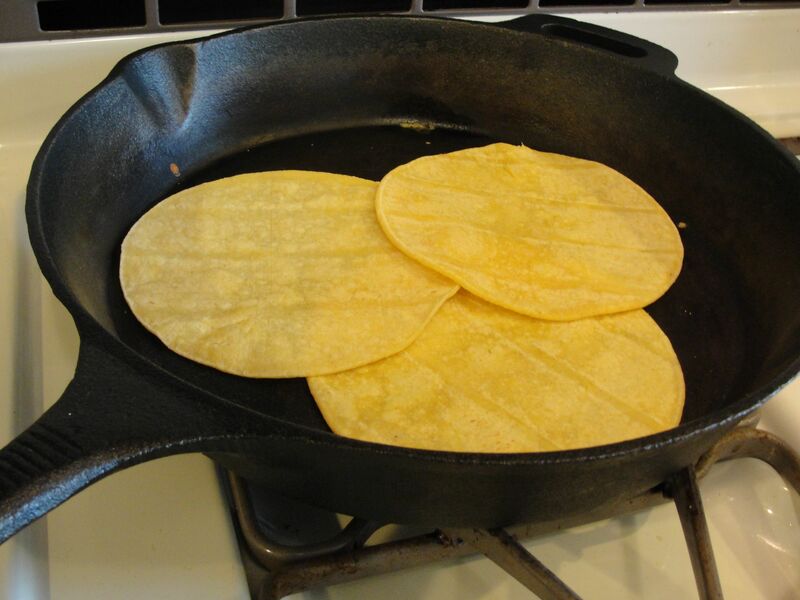 Concurrently, I warmed corn tortillas in a skillet, and then wrapped them in a towel; this keeps them from getting wet underneath, e.g., if set on a plate when they’re very warm. Lastly, I assembled the tacos, topped with a dab more of chili garlic sauce and, as you can see, placed “points” of the white portion of a napa cabbage leaf under each taco. While intended for presentation, this worked out nicely to support the taco in hand; otherwise, one often must resorts to using two tortillas per taco so that they don’t break when the moist ingredients are placed on top. These tacos were easy and delicious. They’d probably be nice with mu shu pancakes or flour tortillas as well. If you want to eat more vegetables, it’s a good way to go. My number of mediterranean or Tex-Mex recipes are both greater than asian currently, buth they’re each pretty close, and indian not so far behind!